I have mentioned explosive behaviors once or twice in past posts, and have written about anger in toddlers before, but I also wanted to offer a solution to these breakdowns. As I mentioned in a past post about discipline, time-outs did not work for us for our daughter. However, the concept behind a time-out (stepping away from your actions and taking a moment to consider them) can be done in a better way. We have a calm down box. Before starting it, make sure to explain that it isn’t necessarily a punishment, it’s just to help get your child back to neutral. We are working on walking away from anger stimulants (ie someone being mean at school) so my daughter can learn to calm herself as oppose to punching the other kid in the throat (yeah…). I know the anti-punishment movement can seem hippy-dippy to some parents, and I’m not saying certain behaviors don’t require discipline (ie punching the other kid in the throat). 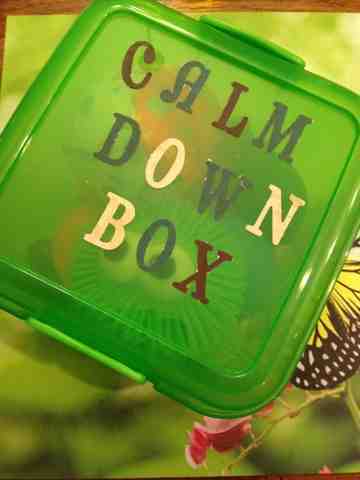 The calm down box is simply a way to teach your child how to soothe themselves enough to come back to center before moving on to the next thing. This has been one of the biggest life savers as far as parenting goes for us. Now that my daughter is 3 and is starting to be able to verbally explain her feelings and emotions better, she realizes that the calm down box is helping her. I have a basic plastic storage box and I rotate the items inside, except for a few standard pieces. Below are some options of things to put in your own calm down box. These are still mesmerizing to me, even as an adult. We use one as out calm down timer basically. The sound of a ticking timer can be a little less than calming, so instead we have one of these that I flip over. I tell her she has to play with her calm down box until all the bubbles have fallen. Usually after a few moments of watching them she’s so engrossed in something else she forgets that it’s there. These have also helped with not being able to go to sleep at night occasionally. Stress balls are not just for the office. Kids can benefit from them too. The brighter and the more squishy, I think the better. I may be the only person the world who still uses CDs more frequently than iPods or MP3 players. For my daughter, the process of finding a CD or Audio Book is kind of part of the calming process. She picks what she wants, puts it in the player, and listens. It’s simple and effective. Sometimes the CD player isn’t enough and headphones are required to really help her escape. I think that’s easy to relate to. Music is needed sometimes, but I think audio books are also great to help kids learn how to calm themselves down. They have to focus on what book they want and then really listen to the words that are being spoken. Touch and feel books are usually for babies and toddlers under two, with some exceptions. However, if your child is playing alone or learning how to soothe themselves a touch and feel book can be very helpful. The act of “reading” along with the physical processes of touching certain materials, can be very soothing. Same token, books like Journey are great because without words the child isn’t intimidated to “read” alone. They just look at the pictures and make up their own story. There are many sites out there with recipes and instructions on how to make your own calm down bottles. They can be a great addition to any calm down box. Some other items that help with restlessness and not being able to sit still can also be useful in a calm down box. If you have tried other things that have worked mention them below! the calm down box and area are great ideas, schools should have them for kids too. I wonder if it has every been studied in the elderly with dementia….Nice ideas.